We’d love your help. Let us know what’s wrong with this preview of The Everlasting Sunday by Robert Lukins. "Striking. Lukins' great achievement is to have created an atmosphere that is at once very much of this world, and musical and timeless. Everlasting indeed." MICHELLE DE KRETSER, Miles Franklin winning author of The Life to Come. "Robert Lukins' powerful, assured writing cuts like a knife into a world cracking with secrets and tension." LUCY TRELOAR, author of 'THE TIMES Book of the Year' Salt Creek. "Extraordinary ... The Everlasting Sunday is a beautifully written, subtle novel, dealing with loss, forgiveness, love, redemption and the complexity of our natures." JOHN PURCELL, Booktopia. "The year's quiet marvel ... A novel of ice, with a heart of fire." BEEJAY SILCOX, Australian Book Review. "Lukins achieves something delicate and spare ..." PETER KENNEALLY, The Sydney Morning Herald. "Both savage and tender, The Everlasting Sunday, is a haunting debut novel." Better Reading. "Lukins richly evokes the hermetic world." SH, The Saturday Paper. "Balletic ... often quiet, but bursts out vividly." RONNIE SCOTT, The Australian. "Each sentence lingers on a moment, suspending action like frost creeping through a body of water." ELLEN CREGAN, Kill Your Darlings. To ask other readers questions about The Everlasting Sunday, please sign up. Radford arrives unceremoniously dropped off by his uncle and is quickly taken under the wing of the charismatic West. There is much introspection and confidences shared between the two in their late-night smoking sessions. All the characters seem to be at a place in time they would rather not be. Much like a boarding school the boys sneak out at night to smoke and drink alcohol. There were no rules and the boys had their own methods of punishment when warranted and found things to keep them occupied. Radford at first tries to make sense of the hierarchy and happenings in the Manor. Lukin’s prose are lyrical and haunting with an underlying empathy, they give a mystical quality to the story. The Everlasting Sunday is an atmospheric tale of rejection, friendship, boding and survival. Robert Lukins’ debut novel The Everlasting Sunday (UQP 2018) is a literary delight, a story comprised of poetry, a celebration of the rhythm of language. Set in the coldest winter on record in England in 1962, the novel takes place in Goodwin Manor, a home for boys who have been ‘found by trouble’. In the opening pages, 17-year-old Radford finds himself negotiating the intricacies of the home – the hardened loyalties, the twisted friendships, the turmoil of adolescent hormones, the secrets kept Robert Lukins’ debut novel The Everlasting Sunday (UQP 2018) is a literary delight, a story comprised of poetry, a celebration of the rhythm of language. Set in the coldest winter on record in England in 1962, the novel takes place in Goodwin Manor, a home for boys who have been ‘found by trouble’. In the opening pages, 17-year-old Radford finds himself negotiating the intricacies of the home – the hardened loyalties, the twisted friendships, the turmoil of adolescent hormones, the secrets kept and confidences shared. As the freezing winter takes control of that place, the busy microcosm of the home shelters Radford from his past, but continually throws up challenges that confront his notion of himself and what he wants from life. His friends each have a past too terrible to talk about; through pilfered alcohol and shared cigarettes, they form connections both fragile and deep. The staff of Goodwin Manor are shrouded in their own mysteries. This book tells a simple story of survival, of boys forced together through circumstance, and of the shocking events of one winter that tear everything apart. And while the story itself is compelling and compassionate and strange, it is the telling that is captivating. Lukins’ voice is powerful and unusual; his words dance lightly across the pages before falling heavily with some new revelation. The tension and sense of menace that accompanies his storytelling ratchets up with each chapter … we can feel the suspense, the teenage angst, the creeping anxiety, the fear. Lukins’ characters are finely drawn and memorable. West and Teddy, Lillian and Manny – the cast is disparate and quirky and authentic. The setting – both the place of Goodwin Manor, and the season of Winter – is a character all its own, an immersive and captivating place and time so real that we can feel the icy snow, see the frozen birds, hear the crackling of the fire. Lukins knows how to use white space, how to say less rather than more. The story is not a neatly-tied package, but a shifting fist of snowflakes, melting and reforming into something new. Like all the best stories, it asks more questions than it answers, and leaves us wanting more. Radford and his friends – bad boys though they might be – imprint on our hearts with their childish longings. Their immature hopes and desires are compressed into burgeoning bodies and shoehorned into societal norms; their sweet innocence belies their troubled histories. We see children, not monsters. At first I thought Robert Lukins’ The Everlasting Sunday was going to be a homage to Golding’s Lord of the Flies – a home for delinquent boys cut off from the world by the worst snowstorm on record. Cue all hell breaking loose. But instead I found myself reading a book more akin to Ishiguro’s The Remains of the Day. The Manor is a home for boys ‘found by trouble’. We enter with seventeen year old Radford who has been unceremoniously dropped off by his uncle as the snowstorm worsens. We don’t know At first I thought Robert Lukins’ The Everlasting Sunday was going to be a homage to Golding’s Lord of the Flies – a home for delinquent boys cut off from the world by the worst snowstorm on record. Cue all hell breaking loose. But instead I found myself reading a book more akin to Ishiguro’s The Remains of the Day. A heart-stopping and atmospheric read. Highly recommended. A deceptively quiet, brooding meditation on fledgling masculinity, The Everlasting Sunday simmers with menace and tension, making the occasional explosions all the more cataclysmic. And what a pleasure to read such beautiful - I'll even go so far as to say "classical" - prose. How the hell is this a debut? Incredibly moody book, that plonks you in a home for troubled boys in the middle of a cold spell in 1962 England. Lukins creates a fully realised world inside the house, with rich and uneasy relationships unfolding as the ice and snow set in. Things build towards a conclusion with almost unbearable tension. This is a wonderful debut. Highly atmospheric, yet deeply unsettling, The Everlasting Sunday is a meticulous account of toxic masculinity within a setting of inverted institutionalisation. During a winter freeze, a teenager arrives at a reform home for boys located deep in the English countryside. We don’t know what he’s done to arrive at this fate, and indeed, as we quickly learn, it is the policy of this home that the boys do not have to disclose their reasons for being there unless they personally choose to. There are Highly atmospheric, yet deeply unsettling, The Everlasting Sunday is a meticulous account of toxic masculinity within a setting of inverted institutionalisation. During a winter freeze, a teenager arrives at a reform home for boys located deep in the English countryside. We don’t know what he’s done to arrive at this fate, and indeed, as we quickly learn, it is the policy of this home that the boys do not have to disclose their reasons for being there unless they personally choose to. There are no locks on the doors inside of this home and the boys roam freely, even down to the local village, challenging the traditional notions of a reform home as a place of retribution. The home is run by Teddy, a man who sees his only purpose as keeping the boys safe and alive, and who takes a quite liberal view on what the boys should or shouldn’t be doing with their time while living at the Manor. Yet I found his philosophy somewhat contradictory in terms of its grounding in reality. The boys within this home have all been sent there, put away in a sense, to a far corner of England where they essentially can become someone else’s problem. They have all done something to earn this fate, and they are all, by inclination, volatile to a certain degree. Teddy aims to keep them safe from a worse fate, yet he is powerless to protect them from each other. Institutionalisation without structure sees the Manor flex under the stress of anarchy, on more than one occasion. While I could appreciate where Teddy was coming from, I honestly felt his method was flawed and doomed to failure. In trying to eliminate toxic masculinity, he instead inadvertently fostered it. There can be no doubt though, of the positive effect that Teddy tried to have on each of the boys. He offered them truth and bore them no judgement. For those who were willing, what he offered was a safe passage through adolescence. A chance at a fresh start. This novel veers from quiet contemplation with moments of wonderful introspection and observation into a brutality that is confronting and at times disturbing. I balanced between being repelled by some of the actions by the boys, yet compelled to keep reading, gripped by a narrative strongly underpinned with a sense of doom. As a unique touch, Robert Lukins has fashioned Winter into a character, a presence unlike any other I have encountered within a novel before. Robert is quite a master with words, lyrically weaving them all together with visual clarity, blunt force, and impeccable timing. While there were parts of this novel that I found difficult to read, I do like how the narrative challenged me. There is a lot to contemplate within this novel, and a lot to appreciate. 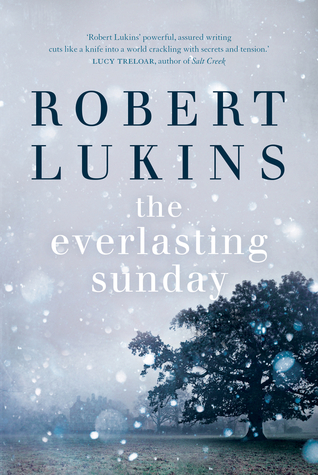 The Everlasting Sunday is a fine debut and I feel certain this is only the beginning of great literary endeavours for Robert Lukins. What a debut! It’s all mood and atmosphere and I loved it. A truly gripping debut novel. I loved that for most of the book I had no idea where it was going. The characters drew me in, and by the end I wished I could hug each and every one of them. They felt so real, so broken. ‘One Flew Over the Cuckoo’s Nest’ meets Linda Grant’s ‘The Dark Circle’ in this quietly violent tale. A simmering tension throughout and a certain melodrama reminded me of the reading experience of ‘Elmet’. An atmospheric Bildungsroman observing the fragility of masculinity, the obligations of friendship, and the question of salvation. Thanks so much for sending me a copy, Robert! A wonderful debut. One of the first things that struck me about Robert Lukins's novel The Everlasting Sunday was the wonderful prose. Dazzling and lyrical prose is very much fussed over these days but one of my pet hates is seeing that sort of prose with characters who are neither lyrical nor dazzling in their character or thinking and is misplaced. Not so with The Everlasting Sunday. In The Everlasting Sunday the prose is poetic in the interesting juxtaposition of words, ie “The uncle began to whistle a tune that One of the first things that struck me about Robert Lukins's novel The Everlasting Sunday was the wonderful prose. Dazzling and lyrical prose is very much fussed over these days but one of my pet hates is seeing that sort of prose with characters who are neither lyrical nor dazzling in their character or thinking and is misplaced. Not so with The Everlasting Sunday. With this unusual prose engendering a myth-like quality to the narrative, we know we are in for something special. I loved the way both the winter and the boys en masse are depicted as characters in the book. The winter of 1962/1963 (the coldest winter in nearly three hundred years) is mythic in the depths the temperatures plummeted to. It was known as the big freeze and just before it closed over the landscape seventeen year old Radford arrives at Goodwin Manor - a home for boys who have been “found by trouble”. Some alliances are already in place when Radford arrives and others are formed, West in particular looking out for Radford. Teddy who runs the home is an exceptionally drawn character - cheerful, worn down but doing everything he can for the boys. Gradually menace creeps in along with the freezing weather and I raced to the end. A marvellous, original read. Highly recommended. Beautiful writing, subtle, and a powerful atmosphere. Impossible to sum up in a few lines, but this is a powerful coming-of-age novel depicting daily life in a home for boys 'found by trouble' in the early 1960s. The carers are empathetic, and their kindness and warmth contrast with the harsh weather and landscape. I particularly liked that winter had a voice. So will written. Really captures the isolation and the longing the boys have. My only criticism is that not a lot happens. Beautiful descriptions and portraits of the characters, but they don't do whole lot. What is it, to be a boy? An even greater challenge: what is it to be a boy who is troubled? That can mean so much. One can be troubled within, or troubled without. In Robert Lukins’ novel The Everlasting Sunday, all the boys who are sequestered at the Manor are troubled. And yet through both the machinations of the plot – their de facto carer never reads the files on each boy sent to the Manor – and Lukins’ writing, each boy is able to be shorn of his trouble until all that remains is the boy. For What is it, to be a boy? That can mean so much. One can be troubled within, or troubled without. In Robert Lukins’ novel The Everlasting Sunday, all the boys who are sequestered at the Manor are troubled. And yet through both the machinations of the plot – their de facto carer never reads the files on each boy sent to the Manor – and Lukins’ writing, each boy is able to be shorn of his trouble until all that remains is the boy. For us, and for them. They go by their last names (Radford, West, Lewis), perhaps in vain attempt at becoming the adults they don’t quite feel they deserve to be. The adults at the Manor do the opposite (Teddy, Lillian, Manny), as if each group is suggesting to the other that they want to be seen different to how the outside world wants them to be. Radford is the new arrival, there on Boxing Day, and his story at the Manor is encompassed by the cold, frozen winter of 1962. His stay is not a rite-of-passage as such, but still marked with the uncertainty that surrounds teenage boys and forced companionship. He barely speaks on arrival. For a boy, suffering against the weight of expectation as to who he has been, and who he should be, silence can be the best choice. And, briefly, it works. But gradually Radford becomes one of them, one of the boys who live there seemingly without past or future or without goal during their stay under Teddy’s care, other than to stay alive, and away from their families. His emerging bong with West is the heartbeat through the novel, coloured by fumbled attempts at earnestness, at humour, at the pleasure of true friendship. Lukins gives their dialogue the sensation of boys discovering how to communicate. Away from everything, the boys find sincerity, even if Radford mistrusts this at first. Gradually, the Manor emerges as a place sheltering these boys under their own self-rule. Needless aggression or unpleasantness is the exception, and the boys gravitate toward moments of belonging, experiences where they can accept one another and their own selves. And yet: the darkness of the novel comes not from within, but from the trouble without. The expectation that they are troubled, they are damaged, they are diseased, is what causes this frozen idyll to be disturbed. Lukins doesn’t aim to instruct how such boys should be raised – there is no hidden cure in these pages – but it is clear that the burden of prophecy on boys to be trouble is at the heart of their tragedy. His writing is full of compassion for the young charges, glimmering with hope that boyhood need not be taken alone, or filled with loneliness. This book surprised me as a debut novel. That is why I gave it a 5 score instead of a solid 3. "The air, beyond chill, made short work of cutting through Radford’s trousers and long johns. His socks became wet and winter made house in his bones." The assuredness of this debut suggests there are half a dozen manuscripts sitting in Robert Lukins’ desk drawer waiting for the readers they deserve. He has crafted a tense survival story in The Everlasting Sunday; here we have a manor filled with troubled boys thrown together by circumstance with minimal supervision or structure. But what results is not a Lord of the Flies experience. We are not surprised by the savagery of the boys, but by unexpected kindnesses, vulnerability and the fragility The assuredness of this debut suggests there are half a dozen manuscripts sitting in Robert Lukins’ desk drawer waiting for the readers they deserve. He has crafted a tense survival story in The Everlasting Sunday; here we have a manor filled with troubled boys thrown together by circumstance with minimal supervision or structure. But what results is not a Lord of the Flies experience. We are not surprised by the savagery of the boys, but by unexpected kindnesses, vulnerability and the fragility of friendships that are at once too deep to express and shallow enough to shatter at the thought of what remains unsaid. Atmosphere is forefront in this novel, which read to me like I imagine a snow-globe might: it conserves a feeling or moment in time, one that looks peaceful at first but is shaken into turmoil by a cast of characters with unsettling and unspoken histories. The sense of place is strong, but never settled enough for one (be it a character or a reader) to feel at home there, as there is a continuing sense that Goodwin Manor may simply slide into the deep winter beyond. Stunning. Read it in one sitting. Beautifully written and so bittersweet. Shades of Eveyln Waugh with something all Lukins' own. Read it. This is a little off the beaten track compared to the paths I usually tread for my reading pleasure but it's a diversion that I am glad that I took. Goodwin Manor is a last refuge for boys who are found by trouble as the author puts it and The Everlasting Sunday follows Radford, one such unfortunate who spends the great winter of 1962 there. It's a tale of no little warmth, considerable cold and harsh cruelty which put me in mind of a dysfunctional Dead Poet's Society. The friendships and enmitie This is a little off the beaten track compared to the paths I usually tread for my reading pleasure but it's a diversion that I am glad that I took. Goodwin Manor is a last refuge for boys who are found by trouble as the author puts it and The Everlasting Sunday follows Radford, one such unfortunate who spends the great winter of 1962 there. It's a tale of no little warmth, considerable cold and harsh cruelty which put me in mind of a dysfunctional Dead Poet's Society. The friendships and enmities that Radford and the other boys form are the crux of this claustrophobic story which is beautifully illustrated by the almost poetic yet direct prose that Lukins employs. More than most authors he conjures vivid imagery with a real economy of words. Kevin Spink, making his Audible UK debut is given the task of narration and does a credible job of bringing characters like the enigmatic Teddy, the authority figure in the house to life. Some odd pronunciations of words such as belfry and hearth may grate a little on Anglo ears but overall he has the voices to do the story justice. The Everlasting Sunday is set in a boys home in England in 1962. The cold of the setting mimicks the isolation of the boys situation and their own minds. It is not always a comfortable read as there is tension and trauma but there is also joy and tenderness. If you like a strong authorial voice then you will thoroughly enjoy Robert Lukins' work, if you are after something more generic then this book may not appeal to you as much. His opening sentence is simple enough - There are things more mira The Everlasting Sunday is set in a boys home in England in 1962. The cold of the setting mimicks the isolation of the boys situation and their own minds. It is not always a comfortable read as there is tension and trauma but there is also joy and tenderness. Haunting story of a youth put into a strange care institution for reasons that are not disclosed until the end of the book. I loved the language and the pace of the story. The combination of the volatile nature of the boys with too much time on their hands and the caring but laid back principal led to an inevitable climax. Two things: one, it is a compliment to the writer that I had not considered I would ever read a book like this written by a young person; and two, when the words are so exquisite it is hard to write a review that amply shines light on that beauty. Hats off to those reviewers who have done so. "Brass sucked two fingers, and whistled." The cover - I always talk covers - is stunning. Giving nothing away. The language in this book is sublime. Robert has such an inventive and beautiful way of showing us the most simple things, things we take for granted, things we didn’t know had a better explanation. I was profoundly moved by this novel, and it will sit with me for some time. 17-year-old Radford is sent to Goodwin Manor from London, for some reason unspecified except that he has been ‘found by The Everlasting Sunday is the debut novel of Melbourne author Robert Lukin who has previously been published in the usual Australian literary magazines – but the novel is British to its freezing winter bootstraps. It is set in 1962 during an epic winter storm in the north, and the cold gets into the bones as only a British winter can. (I remember it from my childhood. Vividly). But school is the least important aspect of Radford’s life at the Manor. The tautness of the prose made me want to study every line to learn from Lukins' craftsmanship. Subtle, nuanced and complex. Wow. If this is his debut, I can see a Man Booker heading his way. The Everlasting Sunday takes place over the one season the seventeen-year-old Radford spends at Goodwin Manor, a home for boys ‘found by trouble’. Under the leadership of Teddy, the manor becomes a haven for these boys, all of whom have reason to feel abandoned. Radford, at first intending to stay aloof, finds himself accepting his place there, becoming protective of the Manor and its staff, and drawn to another boy there, the charismatic and damaged West. I started to think of how I would descri The Everlasting Sunday takes place over the one season the seventeen-year-old Radford spends at Goodwin Manor, a home for boys ‘found by trouble’. Under the leadership of Teddy, the manor becomes a haven for these boys, all of whom have reason to feel abandoned. Radford, at first intending to stay aloof, finds himself accepting his place there, becoming protective of the Manor and its staff, and drawn to another boy there, the charismatic and damaged West. I started to think of how I would describe this book and ended up pressing my hand to my heart. It is a slow, gentle but heartbreaking read, the prose lyrical and transcendental while the story remains grounded in reality. Set in the freezing winter of 1962, the cold permeates the book, frost appears on the pages. There is something about The Everlasting Sunday that feels very much like it is mirroring the quintessential British boys boarding school – there is brutality and volatility to be found in the boys’ behaviour, but also an awesome gentleness and vulnerability. These are not boys who, in the face of isolation, descend into violence alone, but seek to protect each other. One tiny beautiful moment that comes about is that Radford witnesses another boy carefully setting off the various mouse traps in the manor to spare the lives of vermin. There are have questions I have about the novel and the revelations it makes, but that is a mark of how invested I was in the characters and the world invoked, rather than a point of frustration with me. I would have loved to spent more time with the boys and staff of Goodwin Manor, to know more about them. Already I feel a hole in my life where this book was. Robert Lukins lives in Melbourne and has worked as an art researcher and journalist. His writing has been published widely, including in The Big Issue, Rolling Stone, Crikey, Broadsheet and Overland. The Everlasting Sunday is his first novel.